: into Avenue Ausias March. Pass over three roundabouts going straight on. At Fourth Roundabout by Lidl, turn left into Calle San Bartolome. 250 metres further the venue is in “Mercadona” Plaza on left. At next roundabout there is an underground Car Park very close to venue. Go over road to “Supercor” Supermarket. Keep “SuperCor” on left and walk down Avenida del Furs to Roundabout. (400 metres). Turn right into Calle de San Bartolome. Walk forty metres and on your right find Plaza with “Mercadona” in one corner. Venue is diametrically opposite “Mercadona” entrance. Take steps up to Avenida Ausias March. Turn right walk down hill to Lidl. Turn Left on to Calle de San Bartolome. 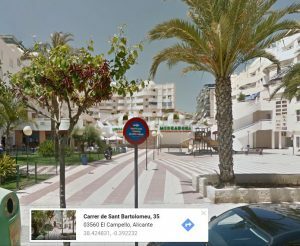 Walk up San Bartolome.. Venue is 250m along on left hand side in Plaza with Mercadona supermarket in one corner.